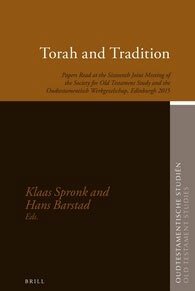 The proceedings of the sixteenth joint meeting presented in this volume will show the fruits of the ongoing cooperation between the members of the British Society for the Study of the Old Testament and the Dutch Oudtestamentische Werkgezelschap. The theme of the conference was ‘Torah and Tradition’. The volume brings together many different approaches in describing the multifaceted traditions behind the Hebrew Bible in its present form.